Reconnected the secondaries and the RLP linkages. Only thing seems to be no squirt from the passenger side secondary accelerator pump, but it doesn't seem to need it when I opened them up tonight. Might still mess with it some more after I get done driving it a bit. I remember something about some Viton pump cups, will have to "search" to see who sells them and order 4. I think I had a small vacuum leak, seems to have been located as idle settles down where I want it much quicker now too. Well seems I may have finally got most of the bugs worked out of the 60! I have driven it more in the last 3 days than I did all last year! Runs good, but still having a small issue with the driver side carb not dropping down to the idle speed screw when I stop. Idle wants to stay up just a bit unless I tap the gas peddle gently. I will get to that soon, just been enjoying driving it. And as it turns out, it has now gotten really warm and I miss the a/c in my truck. But I'll sweat some to drive the corvair. Cliff Tibbitts and Marvin from Lexington Kentucky came by first of the week and we had a great visit. Really supper guys! Edited 2 time(s). Last edit at 06/30/2018 05:17AM by GWLee. Lee: the dr side is adjustable link. With engine at operating temp and the idle too fast just remove the clip from the xshaft and pull upward on link. Probably is will not line up with the hole in the arm you just removed it from but instead will higher than the hole in the arm. Just twist a turn or maybe two to shorten the link and replace with clip and see if idle is slow. 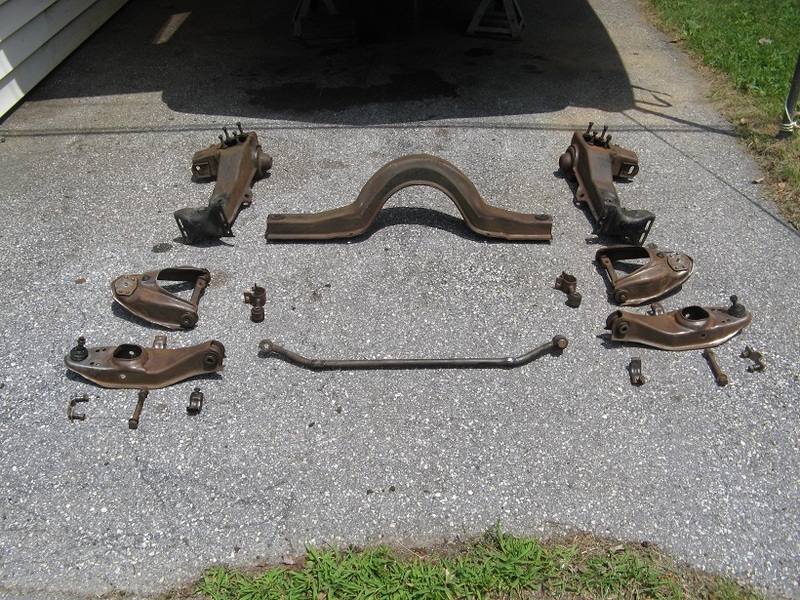 I cleaned the front and rear suspension components enough to take them to The Corvair Ranch this afternoon to have new bushings installed. I also picked up another small box of parts to the tune of just over a grand. Thanks Steve, I'll get on that one day next week! And your correct, the vair isn't bad once you start rolling. Open the floor vents and vent wings and drive. But a/c would be nice, when your spoiled! Thanks for all your help, it has been appreciated! 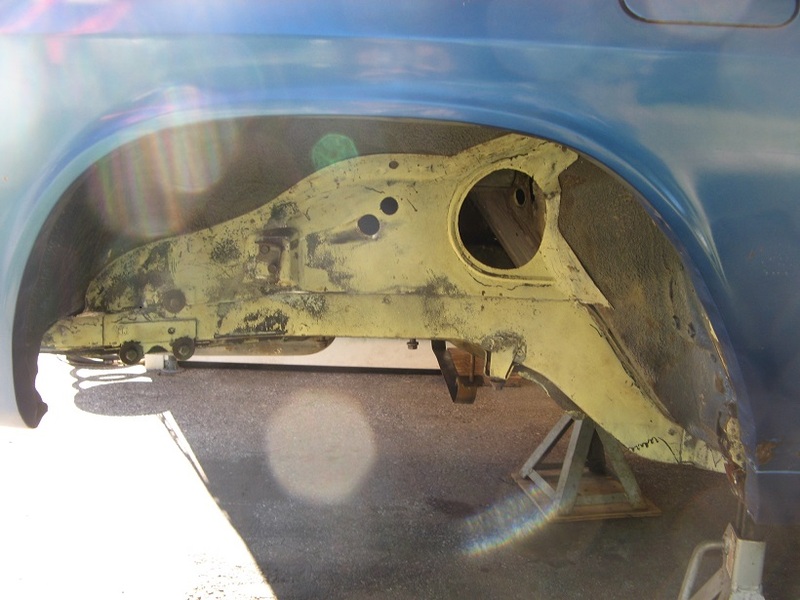 But there is still things to do, like, rebuilding the front suspension. New shocks and possibly new springs. Had new tires mounted, yesterday(does that count for today?) Found out my front shocks were bad, and my idler arm and pitman arm have play. I knew my sterring was a bit loose. Just got back from going to Dahlonega, GA for their July 4th car show in the '63. Great weather and about 100 cars. Wide variety of other makes. One other 'vair. a '65 Corsa vert. Nice 230 mile round trip. Changed the oil in the '63 and got it on the lift to start getting it cleaned up for Pittsburgh. Sure is easy waxing and cleaning the lower sections of the sides with it in the air! Went to a car show today with about 200 cars and there were two other Corvairs there, a 65 Monza and a 63 Corvan. To my great surprise I won the peoples choice award! While cleaning the crossmember using my pressure washer, I discovered a mouse nest inside the center section and did my best to flush it out but it was soaking wet. I'll wait until things dry out and use my air hose to blow out anything that might remain. The great news is that the crossmember appears to be solid. Other progress was cleaning the front wheel well's and straightening a couple of pieces of bent sheet metal in the tunnel area. While cleaning the passenger side wheel well area, I discovered that there are actually two VIN numbers stamped on the frame rail. I have removed several front crossmembers over the years but this is the first time I have ever spent as much time under the a Corvair cleaning the frame rails both VIN numbers match but I didn't expect the second one. I'm making progress, slowly but surely. The project has not yet gotten out of hand, but there is still a chance it will. 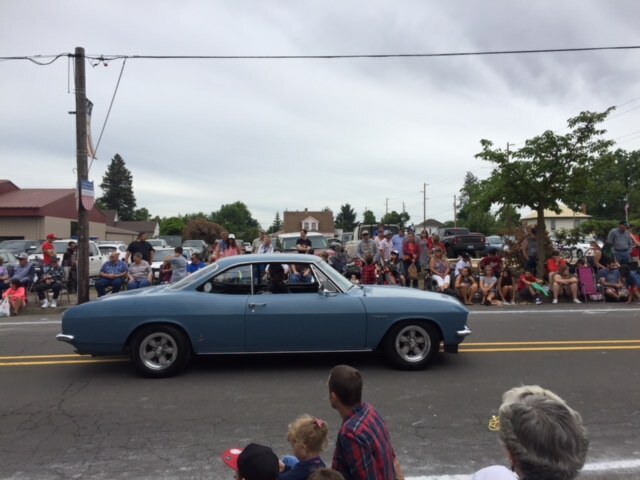 Went to a car show Saturday, was only Corvair there. 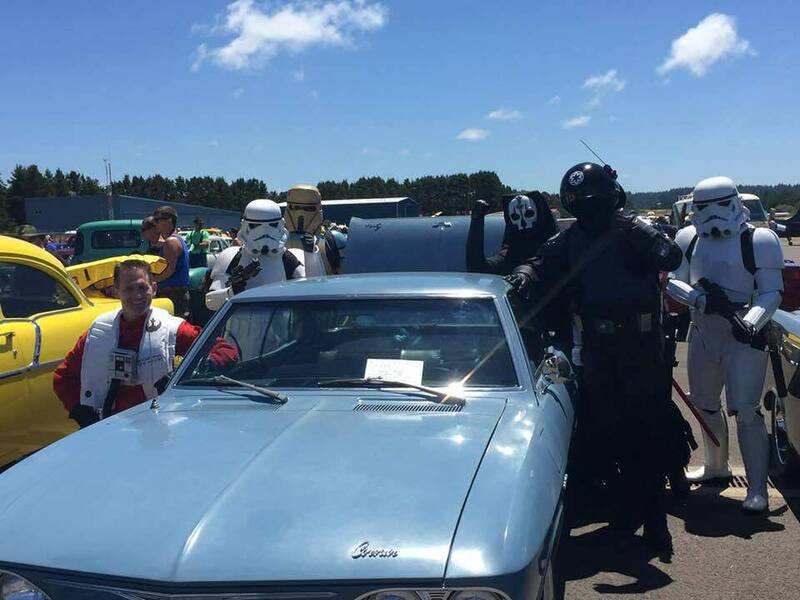 Got to combine my love of Star Wars and Corvairs into one event! I'm the guy in the black helmet. 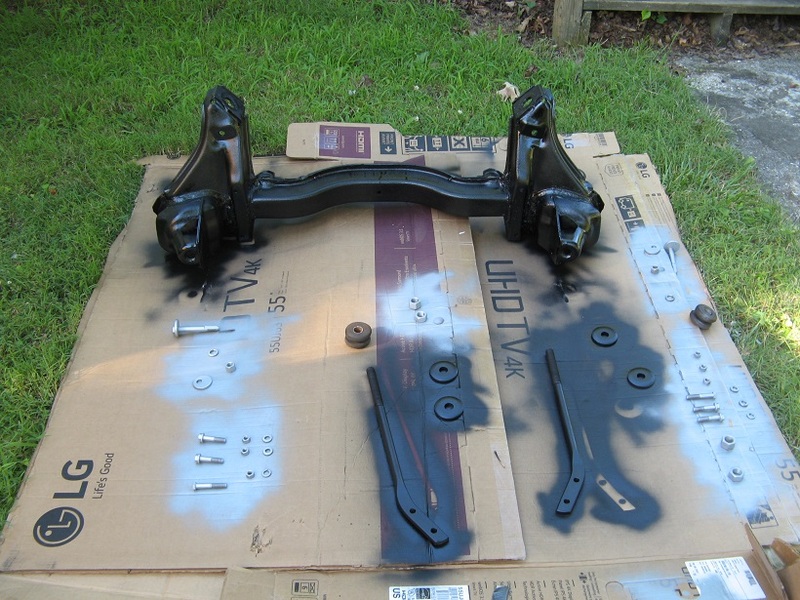 The third photo is the first coat of paint on the crossmember and hockey stick struts along with some of the related hardware that is drying as I type this. More coats of paint to follow on everything except the threads. I am painting different components different colors mostly to illustrate that I didn't simply spray bomb everything assembled. The crossmember is Gloss black, the hockey pucks are satin black, hardware pieces have a cast aluminum finish. This is one time I am glad I save cardboard from stuff folks have shipped me. This piece came from an NOS front panel I bought a while back. Edited 1 time(s). Last edit at 07/09/2018 03:02PM by Caraholic4life. Working on a non working gas gage . I recently moved so all my test eq is in a box somewhere. The gage shows full all the time so I am guessing I have a bad ground or the float on the sender is stuck. It has a new sender and tank. It could always be the gage its self I guess. Dont think it would show full all the time though. I will just go buy a cheap test light and if I dont find a bad ground and am getting power I will just button it back up . 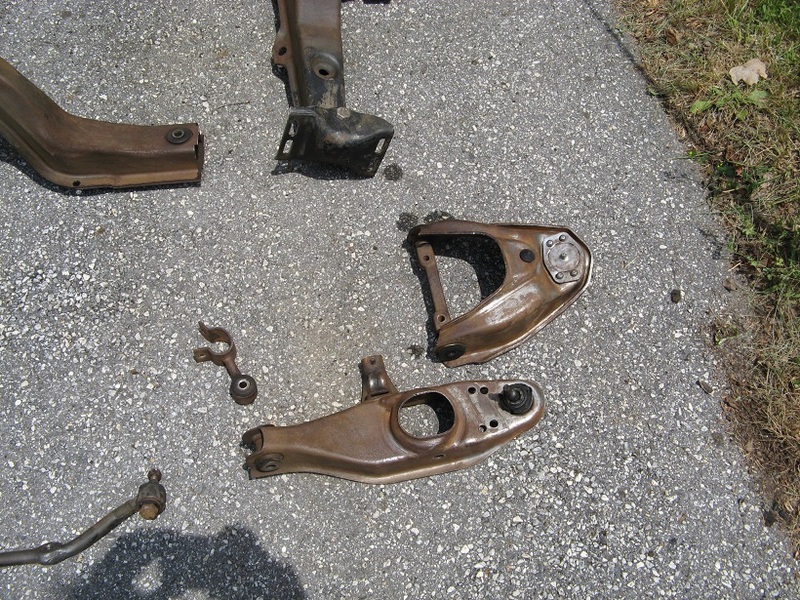 I "stringed" it so that I could measure the front and rear toe-in after replacing the stub axle seals,halfshaft U-joints, and installing Heim Joint lower links. I checked and adjusted front and rear camber by using a plumb level that contacts the wheel rims. On the end of the plumb level I rested an inclinometer designed to measure the pitch of a surface in inches per foot and used the arctan to determine camber degrees. Replaced the pan gasket and O ring on my 65 PG. I hope this will keep the garage floor less oily. Hope to have the 66 with the 4.3 on the road this fall. Getting closer each time I work on it. got the old 3.8 package out of the car and got the car sitting back down on blocks. Now, a whole lot of cleanup and trimming, to figure out how to fit the new 3800 package in! Changed the oil and filter on the 1964 Spyder Coupe. Used a 50 year old Fram oil filter. Should be good for another year since I don't put a lot of miles on it. Used 15W30 Mopar oil, and my engine smiled at me and said "thanks dad". Went through the pickup full of parts I bought at the convention. NORS EM front fender "lower half". 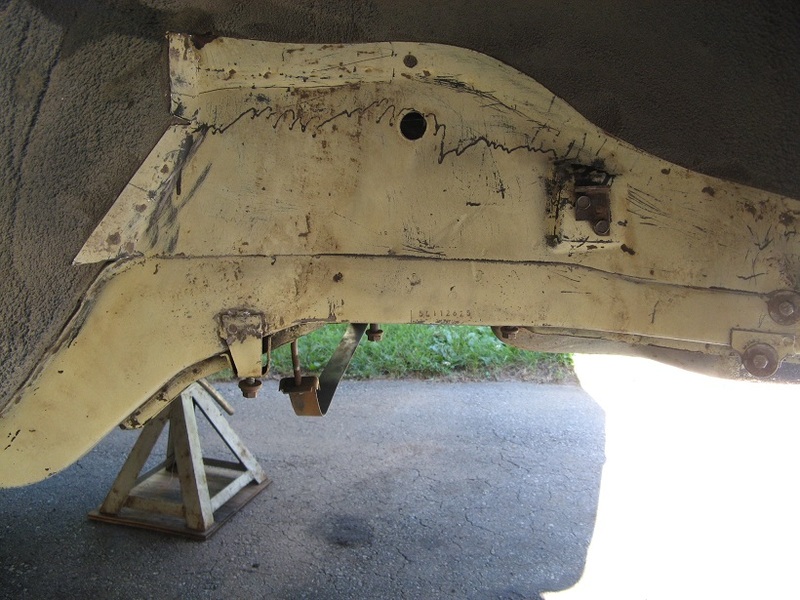 Front lower "gravel pan" for Brian's 64.
pair of NORS 1/2 rear quaters for Brian's 64. Used EM A/C condenser for my 62 A/C Monza. NOS set of Cal Custom Baby Moons and trim rings for my 62.
plus bags full from Clarks and other vendors. Saved up for a year to buy this stuff. But, it is better than Christmas presents. Talked to my body man. 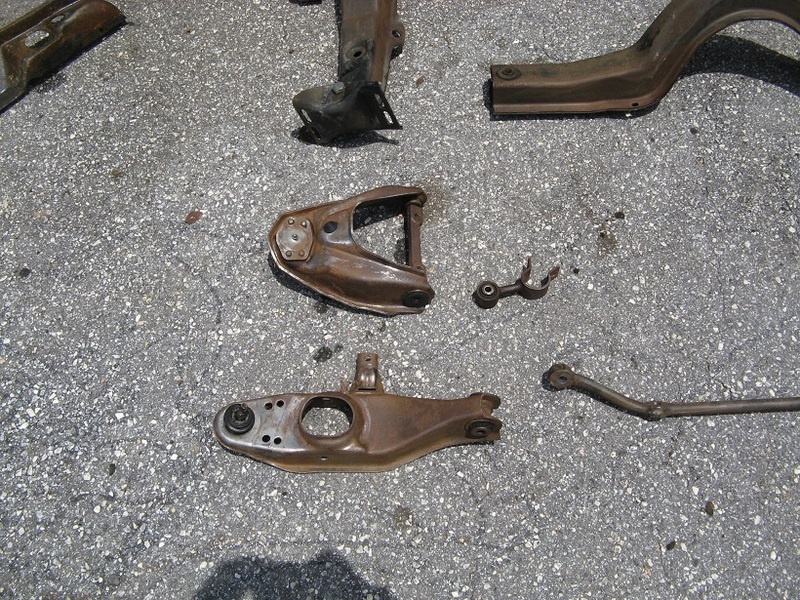 Worked on clutch pulleys and brackets for Tom's 64 that we are converting from PG to 4 speed. 62 Monza Sedan A/C with cloth bench seat option.